Isle of Man Steam Railway 0-4-0 diesel locomotive No.18 Ailsa stands at the head of a rake of coaching stock in Douglas station on the morning of 9 May 2017. 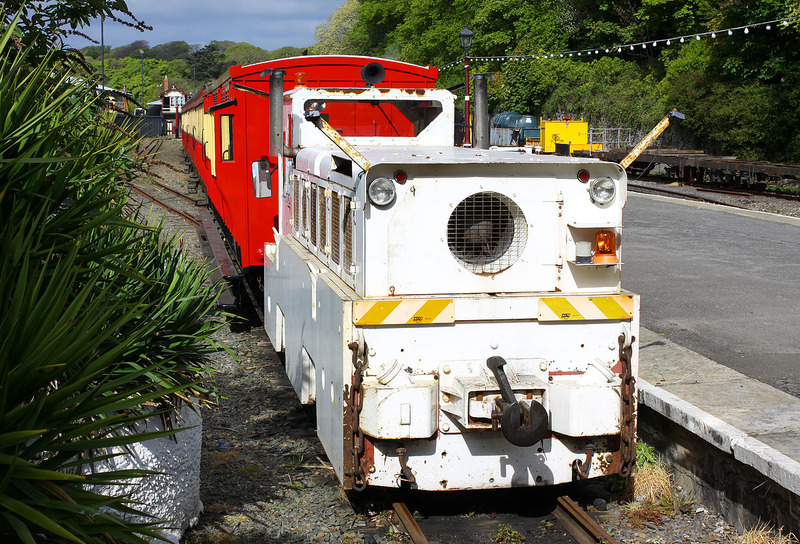 Ailsa was built by the Hunslet Engine Co. in 1994 for use during the construction of the Channel Tunnel. However, it wasn't used, and instead was regauged, and used on the Jubilee Line extension of the London Underground. It then reverted to its original gauge and moved to the Isle of Man. The original intended use of the loco is reflected in its reduced height, which slightly restricts the driver's view. This explains the addition of cameras on arms attached to the corners of the loco.